A Transportation Security Administration (TSA) worker screens passengers and airport employees at O'Hare International Airport on January 07, 2019 in Chicago, Illinois. Federal workers furloughed by the ongoing partial government shutdown have been bearing the brunt of the political standoff between President Donald Trump and Congress over funding for a border wall. Those federal employees are feeling the squeeze on their wallets. As the stalemate drags into its third week, the impact may soon be felt by the wider U.S. economy. The shutdown, which entered its 21st day Friday, began after Trump and Congress failed to pass a spending bill over the president's demand for $5.7 billion in funds for a border wall. If it continues into Saturday, the shutdown would become the longest on record. In November 1995, a budget standoff between President Bill Clinton and House Speaker Newt Gingrich produced a five-day shutdown that ended when Congress passed a temporary spending bill. But the underlying disagreement remained unresolved, prompting a second shutdown that lasted 21 days. The final budget compromise included modest spending cuts and tax increases. The impact of the latest shutdown is already being felt by more than 800,000 furloughed workers, who were supposed to be paid Friday and will not receive paychecks covering the past two weeks. That represents a loss of more than $2.2 billion in consumer spending by workers from a wide range of government agencies, according to data from the Center for American Progress — a setback for the economy and for Trump, who has taken credit for the country's economic growth and low unemployment rate. Furloughed workers at the Department of Homeland Security will be the hardest hit, with a total loss of $637 million, followed by the Justice Department, where employees will miss out on $413 million in checks. The impact also could show up in the official jobs numbers tracking the health of the labor market. That's because the survey used to estimate the jobless rate was conducted this week. But it's not clear just how those furloughed workers will be counted. Workers who were required to work this week would be classified as employed, according to a BLS statement, even if they aren't getting paid. Others who are not working would be considered "unemployed, on temporary layoff." Still others, who work less than 35 hours this week because of the shutdown, would be recorded as "part time for economic reasons." "Given the size and complexity of the nation's job market, and the relatively small sample size of the household (employment) survey, it may not be possible to precisely quantify the impact of the shutdown," according to the BLS. Still, the impact could be significant. In December, when the economy added 312,000 jobs, the nation's unemployment rate rose to 3.9 percent. If all 800,000 furloughed workers are counted as unemployed in January, that would add four-tenths of a percent to the number, according to CNBC calculations. That could add yet another political element to the shutdown's impact. Trump has frequently touted the country's low unemployment rate. "We have the best job numbers virtually that we've ever had," the president told reporters in the Oval Office on Wednesday. "For African American, the best ever. ... Hispanic, Asian the best ever. The best in 50 years in the overall number, and soon that's going to be beaten." That $2.2 billion worth of missed paychecks could prevent federal employees from making their rent payments on time or putting food on the table. 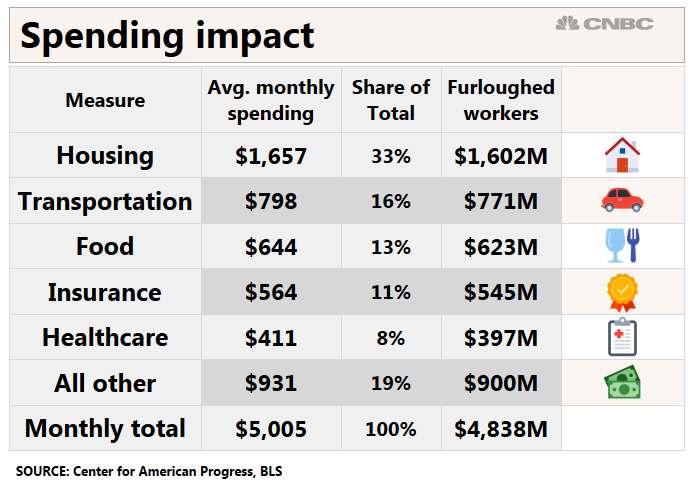 Overall, the furloughed employees are putting $4.8 billion on average back into the economy each month. Some of that spending would be made up once the shutdown ends and back wages are paid to full-time workers. But for many federal contractors, those lost wages will never be made up. Depending on how long the shutdown lasts, consumer spending could slow as furloughed workers dip into savings and take out loans to cover basic expenses. That would conflict with the president's long-running claim that consumer confidence has been boosted by his economic policies. Trump has threatened to extend the shutdown for "months or even years." Based on the spending patterns of the average American household, the lost wages represent $1.6 billion in monthly spending on housing and $600 million on food, according to BLS data. The long-term impact on the labor market is also difficult to estimate. But in the short run, some states would be hit much harder than others, based on the Center for American Progress estimates of the number of federal workers in each state who have been furloughed and are not reporting to work. If all of those workers were classified as unemployed, Washington, D.C.'s unemployment rate would climb to a staggering 25 percent in January as a result of the shutdown, a 19.5 percent increase from November levels, according to CNBC calculations. Before the government shutdown began, administration officials showed signs of worry about its economic impact. Last month, Kevin Hassett, chairman of the Council of Economic Advisers, told CNBC, "Economically it is not something that really has a big long-run effect, but for sure if we had a long government shutdown then it might show up in the jobs report." While the president has taken to calling the situation at the southern border a "humanitarian crisis" in order to persuade Congress to approve border wall funding and end the shutdown, congressional Democrats have highlighted the plight of workers. "[Trump] has chosen a wall over workers," House Speaker Nancy Pelosi said when addressing furloughed employees on Wednesday.